His sense of gaming as escapism was being endangered by the commoditisation of every last scrap of virtual worlds, he felt. "Regardless of how you dress the window, there's no getting away from the fact that players are now living in a shopping centre, rather than a world set apart from the real-world monotony of earn and consume, earn and consume," he wrote. He's not alone. Just look at the hostile player reaction to recent announcements of monetised game services such as Call of Duty Elite, the EA Sports Season Ticket or Diablo III's real money auction house. Greedy publishers are squeezing us dry and nickel-and-diming our hobby to within an inch of its life - so runs the common refrain. I understand the sentiment, but I can't agree with it. Everything about games is changing: the way we play them, the amount we expect of them, how they are made and how long for. If you expect the way we pay for them to stay the same, you're kidding yourself. John reasoned that we don't pay enough up front: game prices have remained static despite inflation and skyrocketing development costs, so game makers are turning to the back end to make up the difference. But I think he's only half right. The change isn't being driven by finances, in the first instance, but by the ubiquity of online gaming. Today, most games are networked by default, and that doesn't just change our relationship with them - on a fundamental level, it changes what they are. Call of Duty Elite is modelled on Halo's Bungie.net service - which, unfortunately for Activision, is free. Now, a boxed console game - a Call of Duty, say, or a Street Fighter - can sustain a player for hundreds of hours of entertainment, to the exclusion of all other gaming. It becomes a hobby in itself. It's far less disposable than the games we used to play, and the hooks that assist such deep and long engagement - the persistence, ranking and rewards - are as much a product of players' rabid enthusiasm for the never-ending online experience as they are the making of it. Endless enjoyment for us means endless work for the developers. An online game is not a discrete work of art that can be polished and perfected; work on it is never done. It requires constant maintenance, rebalancing and refreshment with new content, over and above the need for customer service and technical support. The sums just don't work. If you want this, you have to pay for it. That cuts both ways: if you don't want it, you shouldn't have to, which is why I don't think the cover price should be bumped up. That's just forcing single-player fans to subsidise the multiplayer crowd. How can game makers hold the interest of these passionate communities and turn a profit from their toil? The crudest approach is used by Capcom for its highly regarded fighting games: it builds obsolescence into them. 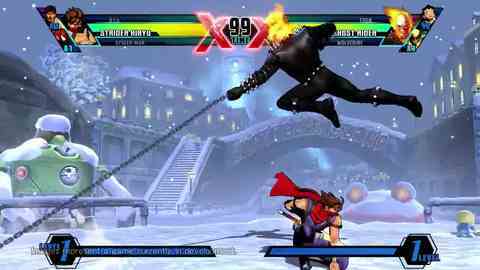 Fans were dismayed, but hardly surprised, when the veteran Japanese developer announced that Ultimate Marvel vs. Capcom 3 would be released a mere nine months after the original game. A devoted community with almost nowhere else to go will inevitably migrate to the new version for its new characters and tweaks - but complain that they're being held over a barrel as they do so. "It should be DLC," some argue, but the truth is that extending a game's financial half-life through expansion rather than replacement scarcely goes down better. Look at the regular invective aimed at the Call of Duty multiplayer map packs from gaming's great Satan, Activision. Notwithstanding the generally high quality of their design and the immense and enduring popularity of COD online, they're held to be overpriced rip-offs propagated through playlist peer pressure.